Fragility and resilience: What can save Europe from itself? What political, economic, and social future lies ahead if the European Union begins to disintegrate? With far-right, nationalist parties on the rise across the continent and the United Kingdom planning for Brexit, worries about the future of the EU have turned from abstract to very real. In his lecture on 'Fragility and resilience: What can save Europe from itself? ', Bulgarian thinker and writer Ivan Krastev reflects on the problems the EU faces on many fronts, from the recent migration crisis to the spread of right-wing populism, and offers his ideas about how Europe can bolster its resilience – and what will happen if it does not. The lecture by Ivan Krastev marks the official opening of the academic year to welcome all incoming and returning students at the Hertie School. It also serves as an intellectual impulse for the public policy community in Berlin. Lecture: Ivan Krastev, Chairman of the Centre for Liberal Strategies in Sofia and Permanent Fellow at the Institute for Human Sciences, Vienna. 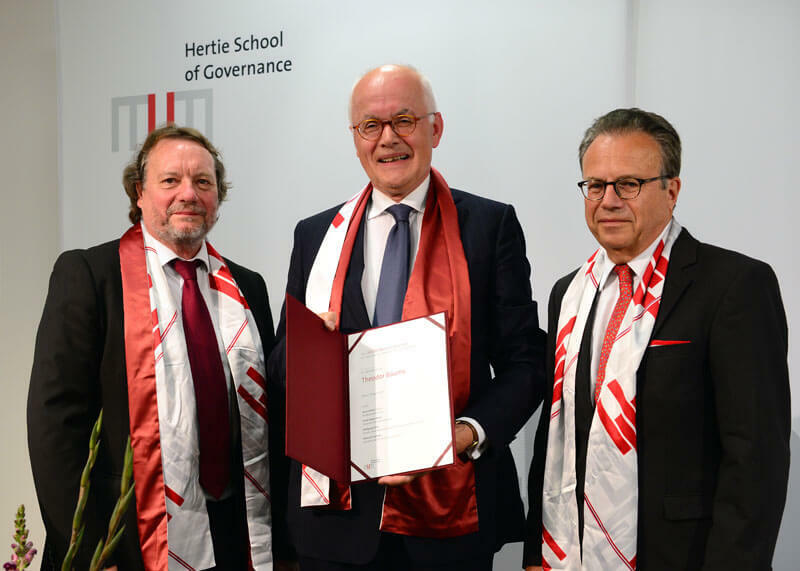 On this occasion, Chairman of the Hertie Foundation and prize jury member Frank-Jürgen Weise presented the first Dr. Michael Endres Prize, honouring outstanding academic personalities in the school's fields of research, to Theodor Baums, Professor for Civil, Trade and Business Law at the Goethe University in Frankfurt am Main.